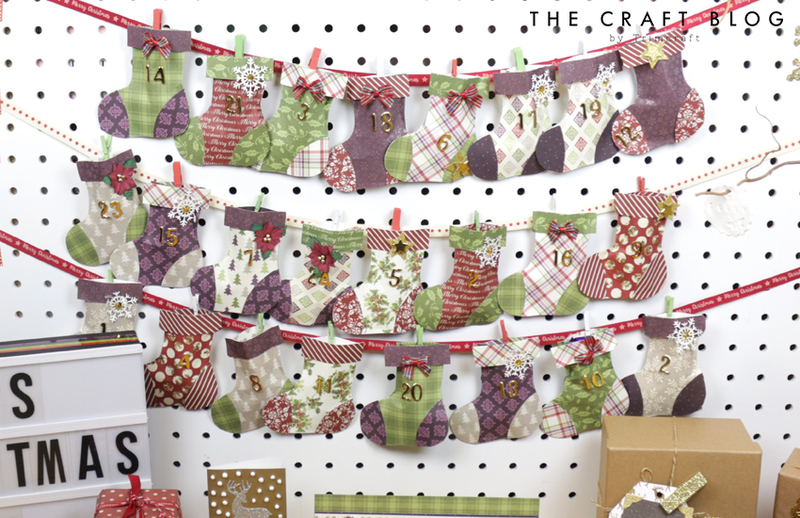 Today, Maxine is going to take you step by step through this festive advent calendar tutorial. Each stocking is perfect for stashing treats in for a fun countdown to Christmas! The First Edition Merry Little Christmas pad is ideal for festive crafts with its traditional prints and colours, and to make this super easy to create, we’ve provided a free template for the perfect stocking shape. 1. Cut out the shapes from the template. Using the template, cut out 24 stocking shapes from a variety of the First Edition Merry Little Christmas Paper Pad sheets. 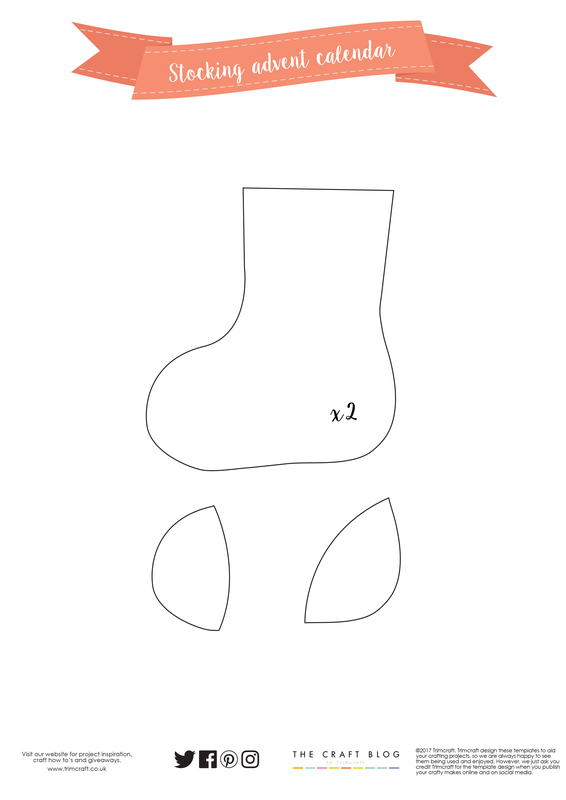 Then, cut out 24 further stocking shapes in reverse to make the back of the stockings. 2. Adhere Dovecraft Perma-Fix tape around the inside edges of each stocking shape, leave the top open though, this will leave room to stash your advent goodies! Attach the back. 3. Cut out the stocking tops, toes and heels from complementing paper. Adhere these to the stockings. 4. Decorate the stockings with die cut snowflakes, bows and star stickers. 5. No advent calendar is complete without a Christmas countdown! Add the Simply Creative number stickers to each stocking for the run up to Christmas. 6. Now it’s time to display your stockings! We attached them to across three lengths of Christmassy ribbon with mini pegs but you can arrange them how you wish – this is the perfect opportunity to get creative! How will you use Maxine’s advent calendar? We’d LOVE to see your versions so don’t forget to #trimcraft when uploading to social media and to share your projects in the Inspiration area. Fab Advent calendar like the little stocking all in a row, I have made some cards with little stockings on looking great.